When you drive over the well washed out cattle grate stop at the Abercrombie river national park sign and grab a pamphlet out of the box, it has a map and info. 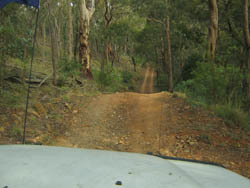 This track is 27km and should take about 2 hours, its the longer way to Licking hole from this side but a great drive. If your in a hurry you can turn off at link rd and follow that until it rejoins at Felled Timber fire trail, its well sign posted and a great track too, steep and muddy and will nock off about 80 minutes. Brass Walls, Little Bald Hill and Bald Hill Fire trails are dry weather only. lots of very steep ascents and descents, not for the light hearted and I would not bring any form of trailer along this track. If its been raining you are not to drive this side of the park and will have to use the west side entrance off Arkstone rd.